As of Voxler 3, it is possible to add labels to a ScatterPlot. Without doing anything special at the time of import Voxler offers labels for the X coordinate, the Y coordinate, the Z coordinate, the XYZ coordinates combined, or any of the specified components. Voxler will also allow you to specify a label column (or multiple label columns in Voxler 4) from your data at the time of import. If this is done, you will also be able to label your ScatterPlot by the specified label column. In Voxler 3, check the Import Labels checkbox in the Select Data Columns dialog during import to import labels from a label column. 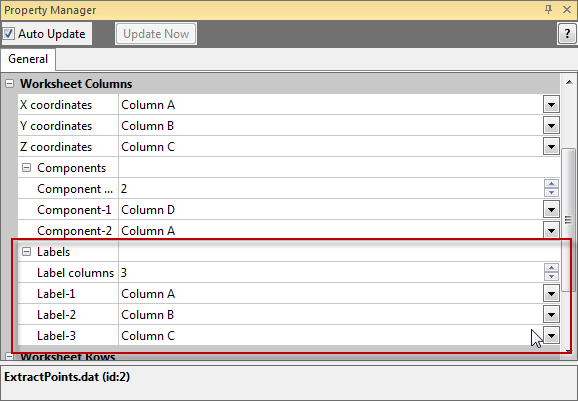 In Voxler 4, specify the number of Label columns and then define which columns are label columns in the Worksheet Columns section of the Property Manager. In the Network Manager, select the ScatterPlot module. Put a check next to Show labels. Change the Label field dropdown menu to the desired label field.